The bottle: They tend to focus on more important things at Wellington craft brewery Panhead Custom Ales, like making awesome beer. I’m assuming that’s why the brewery has decked out some of its craft beers in matching single-colour beer labels – the pale ale is in blue, the APA is in orange, and the pilsner is in yellow. On review is the 330ml bottle of Panhead Pilsner, drunk straight from the bottle because it’s Friday afternoon and, to be honest, after a particularly long week of work, I just need to get my beer on. What it says on the bottle: The classic Kiwi hop profile of passionfruit, grapefruit and sauvignon blanc characters on a combo of New Zealand and German malts. For sentimental reasons we’ve named our Pilsner after the Port Road drags, Petone’s answer to either Fast and Furious or American Graffiti, we’re not sure which. Tastes like: The weekend has finally arrived. This crisp and refreshing pilsner has a fruity aroma – pineapple, peach, mango – as well as a nicely sharp bitterness and slightly spicy hop profile to keep it interesting. It’s hardly what I’d call a traditional pilsner (Pilsner Urquell it is not). Instead, it’s sort of a Kiwi take on the pale lager. 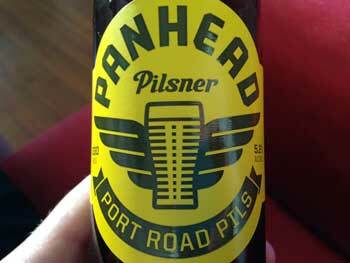 The Panhead Port Road Pils’ balance is tipped slightly in favour of the hops, rather than the pilsner malt, making it a rather jubilant, easy-drinking beer. Is it the best beer ever? At this particular moment, with a hard week at work behind me, yes, this beer could well be the best beer in the world. I really do enjoy a hop-forward pilsner like this one. While the Panhead Pilsner definitely gets my motor running, New Zealand beer drinkers are spoilt for choice when it comes to top-quality pilsners. You could throw a stone in the craft beer section of just about every good supermarket in the country (please don’t!) and hit a really good Kiwi craft pilsner. But this is a very good pilsner, and you’d do well to imbibe a few of these bad boys – on a Friday night or whenever you fancy an interesting but easy-to-drink beer. What else should I drink? I haven’t reviewed them yet for Best Beer HQ, but I thoroughly enjoyed Panhead’s Super Charger American Pale Ale and its Quickchange XPA Pale Ale on a recent trip to Wellington.